Leah Raissis has a voice you need to hear. The 19-year-old makes up one-third of the alternative rock band Exapsos, along with her 12-year-old brother Zane on drums, and guitarist Nate Madera. Leah and Zane formed Exapsos not long after moving to the Seattle area from the East Coast four years ago. 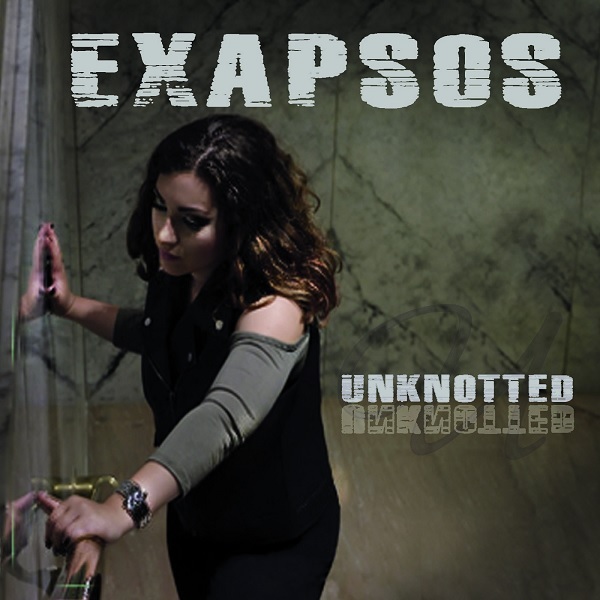 Exapsos has performed throughout western Washington, at renowned clubs like The Triple Door, and shared the stage with a who’s who of rock royalty, including Yes drummer Alan White, and Spike & The Impalers. Leah’s songwriting shows a maturity older than her young age and the arrangements on the band’s new album, Unknotted, perfectly showcases her rock chops and vocal range. The band is busy rehearsing for a string of upcoming shows, including this Friday (April 27) as part of the The Hybrid Festival at Tony V’s Garage in Everett (1716 Hewitt Ave /Everett, 98021). See below for other upcoming shows. 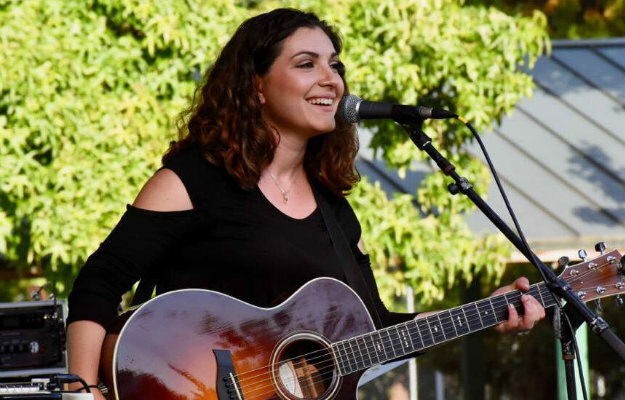 Leah recently chatted with Northwest Music Scene about her musical influences and musical approach. Northwest Music Scene: What’s your earliest musical memory? NWMS: Do you come from a musical family? If not, where does your talent come from? LR: I don’t come from a musical family. I’m not sure exactly where my talent comes from. I always just loved sounds and music. NWMS: What was the first musical instrument you picked up (or did you sing first)? LR: I picked up the guitar first at the age of 6 and then singing came at 11 and then around 13 I started playing drums. NWMS: What made you stick with it? LR: I loved music from a young age. My parents are very into the arts so they passed on their love of the arts to me. NWMS: What’s the first song you remember writing? How old were you? What was it about? LR: The first song I remember writing was when I was 10. It was about why I hated homework. NWMS: When did your brother begin performing with you? LR: He began performing with me in 2012 when we moved from New Jersey to Washington. He was 6 years old. NWMS: What’s your songwriting process like? LR: I write the lyrics and music and my brother writes the drums beats. NWMS: Which comes first, lyrics, hook, or melody? LR: It all depends on each song. Lately, I’ve been coming up with hooks first. NWMS: Who inspires you musically? NWMS: Tell me about your new CD. NWMS: What inspired the songs on the CD? LR: Experiences that I’ve encountered in my life inspired the songs on the CD. LR: I wrote all the songs myself. My brother Zane, wrote the drums beats. NWMS: What do you remember about the very first time you performed for other people? (whether performing your own music or someone else’s). LR: The very first time I performed for other people is when I was around 9. My friends and I were the “band” for our church’s Christmas pageant. It consisted of guitar, flute, violin, and piano. At this point in our lives we were all beginners at these instruments so you can imagine the sounds coming from us. We wanted to make sure that we sounded perfect yet the performance was a complete disaster. In the end while we were performing the power circuit cut so the piano stopped working, my friend on the flute stopped playing because the microphone stopped working, my friend on the violin stopped playing because the piano and flute stopped playing and the only person left playing was me. I would say that there were about 200 watching this disaster happen. Although it was a traumatic disastrous moment, we still laugh to this day about it. First time I performed my originals for other people was when I was 14. The song is called “Possessed.” It’s about a guy who really liked a girl and wouldn’t leave her alone. The song is in the girls point of view and how she thinks he’s stalking her. NWMS: Where was your first paid gig? LR: My first paid gig was at my friend’s birthday party in high school. She payed me $20 to play a few songs. NWMS: At what point did you realize music was your true calling? LR: I realized that music was my true calling when I started writing songs at 10. NWMS: What makes these five so special to you? LR: Ann Wilson inspired me to sing. I remember watching her as a kid on MTV reruns and I was mesmerized and wanted to be able to sing just liker her. Stone Temple Pilots: I love their sound. Scott Weiland’s voice is truly magic. I listen to them everyday. “Dead and Bloated” is one of my favorite songs. Guns N Roses: They are my favorite band. Slash inspired me to want to play guitar. As a kid I was obsessed with MTV and VH1 reruns. One day while I was watching VH1 Guns N Roses came on. I saw this guy with big curly hair, sunglasses, a nice looking guitar playing a really cool song (“Welcome to the Jungle”). At that point I was hooked. I told myself that I want to play guitar. Dave Grohl: He is super down to earth, hilarious, and truly a rocker that really didn’t let anything stop him. He’s very admirable. I love his music, watching his mini films, TV series, and documentaries. NWMS: Being an artist from a young age, what advice do you have for youngsters looking to pursue music, either as a hobby or career? LR: My advice is never letting the failures, setbacks, losses etc…stop you. Learn from them and grow from them. NWMS: What’s your favorite way to unwind from a long day at the studio or following a performance? LR: After a performance my favorite way to unwind is to eat a bbq chicken sandwich with french fries and ranch dip. After a long day at the studio my favorite way to unwind is to watch reruns of Top Gear or catch up on episodes of The Grand Tour. NWMS: How do you keep your voice healthy? LR: I drink a lot of tea and honey, and rest my voice as much as I can. NWMS: If you weren’t creating music, what would you be doing? LR: If I wasn’t a musician, I would be an automobile designer working for automobile brands such as Audi, McLaren, Ashton Martin, or Porsche.